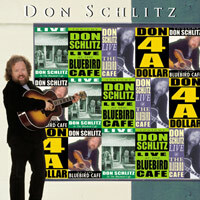 Recorded at The Bluebird Café during his renowned "Don For A Dollar" evenings, presenting songs that DON SCHLITZ most wanted to record for his own album, including his legendary The Gambler. This is the humor, sensitivity, insight and imagination of one of the greatest songwriters of our generation. Mission To Hank is a tribute to the undefeatable determination of songwriters. Don considers Oscar The Angel to be his “best song ever.” Six Words is Don’s hilarious marital advice. Other “Bluebird classics” are available for the first time on this CD. The legendary story-telling ability of DON SCHLITZ is evident in this album and is also the trademark of his music and lyrics for his first musical, “The Adventures of Tom Sawyer,” on Broadway in 2001. Here’s the magic and genius of DON SCHLITZ, LIVE AT THE BLUEBIRD.